Vidler Water is partnering with Signet Solar to construct a 100 MegaWatt (MW) photovoltaic (PV) solar farm north of Reno, Nevada. Is this the only way to sell out a SunFab manufacturing plant? The Washoe County Planning Commission has unanimously approved a 100-megawatt solar farm at the Fish Springs Ranch about 45 miles north of downtown Reno. Vidler Water Company, a subsidiary of PICO Holdings, Inc. (NASDAQ:PICO), plans to build the project on as many as 1000 acres (404.7 hectare) of the 2670 acre (1081 hectare) Fish Springs Ranch. After the Washoe County Planning Commission’s approval of the Special Use Permit, the project is next subject to review by the Regional Planning Commission. As shown above, the layered partnership is between Vidler Water subsidiary, Fish Springs Ranch, LLC, and Gold Solar Energy LLC, a development affiliate of Signet Solar, Inc. and Coast Range Investments LLC. The 62 page Special Use Permit Application is available for download from Washoe County at FISH SPRINGS PV 1 SOLAR PROJECT. The project scope of the application includes a 20 MW Phase 1 and 20 MW Phase 2. Vidler Water plans to build the solar farm in phases over a 10 to 15 year period. 20 MW Phase 1 construction on 180 acres is supposed to start in 2011 at an estimated $75 million cost or $3.75 per Watt. 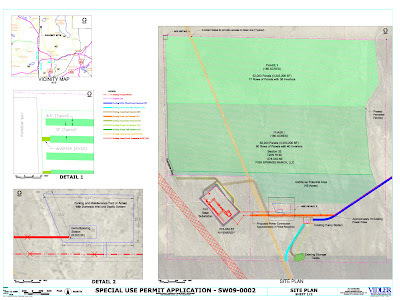 The Phase 1 cost includes “common infrastructure for the entire project” and will interconnect to the adjacent NV Energy, Inc. (NYSE:NVE) Fort Sage 345 kV (kiloVolt) substation. If begun on time, the project can be completed and operating by year end 2011. Phase 1 will use 52000 of Signet Solar’s 5.7 square meter, full size S1 a-Si (amorphous silicon), thin film PV modules arranged in 80 rows on fixed mounting structures and forty (40) Sunny Central 500HE-US inverters from SMA Solar Technology AG (ETR:S92). Although the application references 396 Wp (Watt-peak) PV modules, 20 MW divided by 52000 equals about 385 Wp so the project could be a bit larger than 20 MW when completed. This project is dependent upon a successfully executed Power Purchase Agreement with NV Energy. As such, design and material procurement will not begin until a final agreement is reached. It is assumed for the project schedule development that a fully executed PPA will be completed no later than April 20, 2010. Since the Nevada Renewable Portfolio Standard requires NV Energy to obtain 15% (percent) of the energy it sells from renewables by 2013 and 25% by 2025 including a solar carve out of 5% through 2015 rising to 6% in 2016, NV Energy should be motivated to close a PPA with Fish Springs PV 1. The production timeline for the 20MW solar panels specified for this project is approximately 40 weeks and can be shipped in 5MW increments. Based on the current queue for the Signet Dresden Germany manufacturing plant, the solar panels will require approximately 68 weeks. Coordination will be completed if possible to have panels shipped in quantities of 5MW. This will allow for a phased in construction approach. It is anticipated that 5MW would be delivered each quarter beginning in the 3rd quarter of 2010 to allow for all material completed no later than end of 2nd quarter 2011. In addition to solar developments, the Partnership is also currently exploring the possibility of constructing a local photovoltaic manufacturing plant. This plant would be located in Stead, near the Stead Airport. This project will not only bring PV manufacturing to the local area, but could also develop a solar PV array on Airport Authority property for an additional 100 MW to be offered to NV Energy for purchase. For reference, this site is already in the planning phase with discussions underway with the Reno Tahoe Airport Authority and other permitting agencies. It appears this manufacturing plant would be in addition to the facility planned by Signet Solar in Belen, New Mexico, USA. Avoiding superlatives, the largest completed US PV power plant to date is the 25 MW DeSoto Next Generation Solar Energy Center located in Arcadia, Florida, according to pvresources.com although much larger ones have been announced.